PolarQuest's Sea Endurance and its crew know a thing or two about the Arctic. 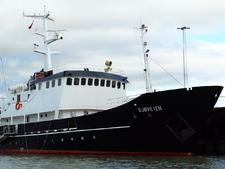 The ship sails expeditions to Svalbard every spring and summer. This rugged expedition vessel was built in 1992 and spent the first part of its life as M/S Quest, ferrying passengers up and down Greenland's west coast. The ship was completely refurbished in 2004 and 2005, and now Sea Endurance caters to just 53 passengers per voyage. The ship offers three Svalbard itineraries: seven-night Springtime in Svalbard, seven-night Svalbard Adventure and 10-night Expedition Svalbard. Each voyage is full of vistas of snow-covered mountains, fjords and sparkling icebergs. A fleet of Zodiacs takes passengers on shore excursions in search of polar bears, Arctic foxes, Svalbard reindeer, fur seals and walruses. Cruisers might also spy seabirds and whales. Some itineraries include a pre-cruise overnight in a Longyearbyen hotel. 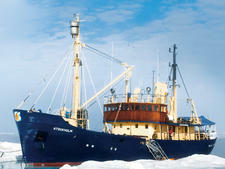 Sea Endurance also occasionally offers Greenland voyages. One unique feature of Sea Endurance is its open bridge policy, where you can meet the ship's captain and executive officers and ask them questions about the challenges of sailing the Arctic. All of Sea Endurance's cabins have windows and private bathrooms with showers. Complimentary bath amenities include hand soap, shower gel and shampoo. Bathrobes are provided for use onboard, and there's a hair dryer in each room. Electrical outlets are 220v, and there are no USB outlets in the staterooms. You also won't find a TV in your cabin unless you book the Owner's Cabin or a Superior Cabin. Those categories do have a TV and DVD player. Just be aware that there's no reception in Svalbard, so you'll be watching DVDs, which are available to borrow from the lounge. You'll be traveling far afield aboard Sea Endurance, so be aware that the ship doesn't have internet access (i.e., no web surfing). However, for a fee, you can send and receive email through your onboard account. You can't transmit or receive attachments, but at least you can send a message if you're in a pinch. The Owner's Cabin comes with some additional perks like bathrobes and slippers for both passengers, two wine glasses and two water glasses, a fruit basket that's maintained daily, and free laundry service. At the beginning of the voyage, Owner's Cabin occupants also receive a complimentary bottle of white sparkling wine or Champagne and a minibar stocked with two bottles of water, two cans of beer, two cans of mineral water, two cans of soda and chocolate. PolarQuest offers a cabin matching program so single travelers can book a shared cabin. Women are matched with women, and men are matched with men. Otherwise, solo travelers can book a twin cabin for single use and will pay a higher fare. While the main focus is the Svalbard archipelago, there are some pretty delectable meals onboard, as well. The dining room is located on Deck 2 and seats all passengers in one sitting. The space is light and airy, with porthole windows along the walls. Breakfast is served buffet-style and includes items like bread, juice, scrambled eggs, pancakes, yogurt, deli meats and cheeses. Lunch is also a buffet, and it usually features soup, bread and salad, plus a main entree and dessert. Dinner is served at the table as a three-course meal; entrees include fish, meat, pasta and vegetarian options. The chef can handle special dietary requirements, but you must let PolarQuest know before you board the ship. When you're feeling peckish, head to the Panorama Lounge on Deck 5, where you can get coffee, tea, hot chocolate and cookies all day long. Sea Endurance's cruise fare includes all meals onboard; beverages including coffee, tea, water and juice; a knowledgeable expedition leader and tour guides; onboard lectures; onshore excursions and activities; comprehensive pre-trip reading material; and an illustrated post-expedition log. English and Swedish are spoken onboard.